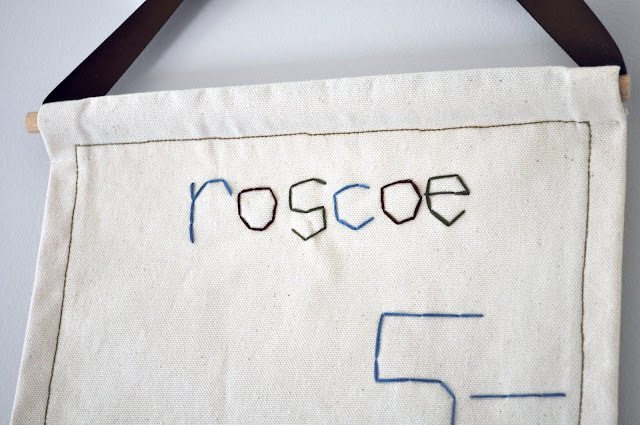 BoldHeartMama: Roscoe's Nursery: Featured on Spearmint Baby! 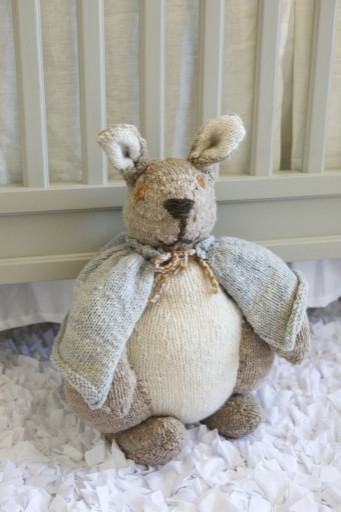 There was something special about his neutral colors, and cozy texture that caught my attention—and his whimsical cape certainly didn't hurt. With his purchase a color palette was born! Later, we had a canvas created from this picture, which now hangs above the changing station. 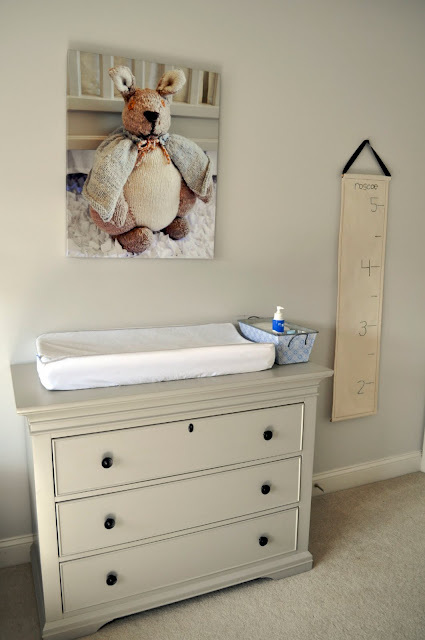 We left spaces for art work, but in the end I really liked the idea of displaying photos of items found within the nursery—talk about effortless decorating! I knew that I wanted the style of our baby's nursery to be an extension of our home, and since my design concept began before I knew whether we were expecting a boy or a girl, I stuck with ideas that worked equally well for either. I love monochromatic looks and wanted to stay in the family of tans, browns, whites, and creams. If Roscoe had been a girl we would have brought in accents of coral or lilac but as it turned out we opted for blue and orange. The first piece of furniture we purchased was the crib. I immediately fell in love with the color—a warm gray—and thought it offered an eclectic twist and a fun challenge to build an entire room around. After unsuccessfully searching high and low for a complimentary changing table, we chose an over-sized dresser in the same finish. 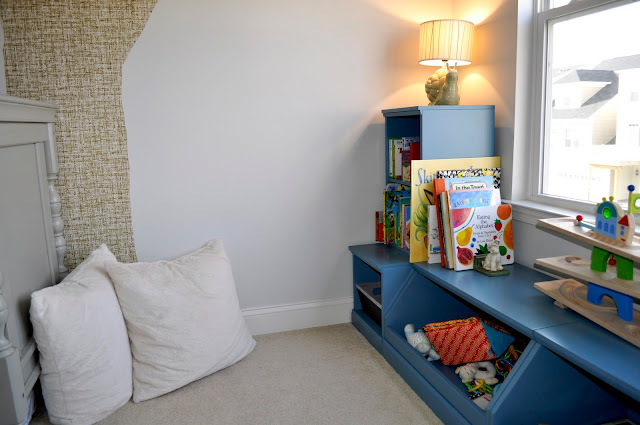 The bookshelf--a muted blue that perked up the color palette and hinted at "boy"—provides great storage for our reading nook, and all of Roscoe's play gear. 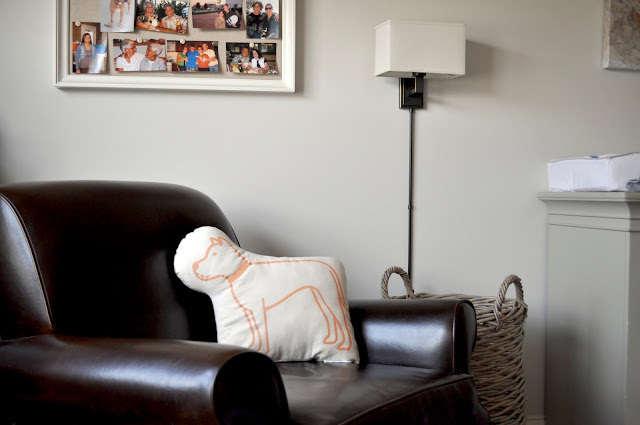 A leather rocker adds masculine character, and a canvas pit bull pillow lightens the mood. A push-pin bulletin board displays photos of Roscoe's aunts, uncles, cousins, and grandparents personalizing the space and adding a splash of color. It's our go-to spot to chat about the people that Roscoe doesn't get to see on a daily basis. It took us several tries to find the right shade of paint, but we finally settled on a color called Whispering Wind--a perfectly hued gray with hints of brown. Andy added decorative crown molding, and painted both the walls and the ceiling, which really makes the trim stand out. 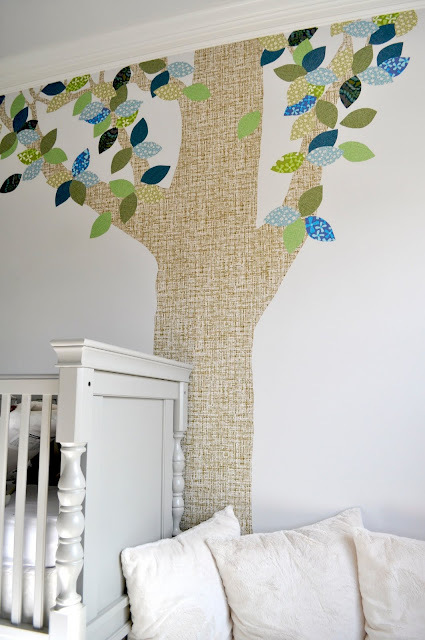 The focal point of the nursery is a gorgeous vintage wall paper tree that spans from floor to ceiling. There are many color combinations available but we chose the "June" style, which comes with leaves that are primarily blue and green. Sold as a do-it-yourself kit, it is applied the old fashioned way with a brush and a bucket of paste. The tree trunk installs in 4 separate pieces and comes with more than 80 individual leaves that you can place however you like. 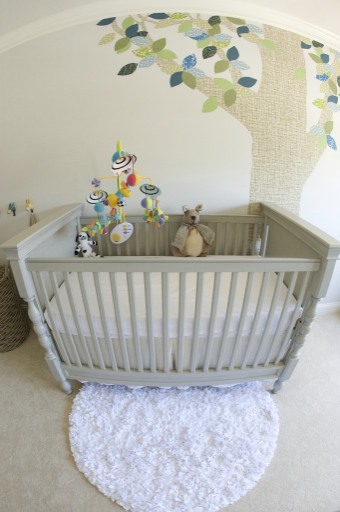 Roscoe's June tree really brings his nursery to life. 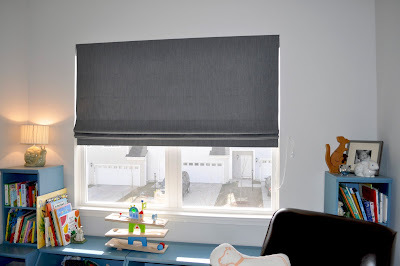 The window treatment is a classic, flat, roman shade in a delicious wool sateen fabric. 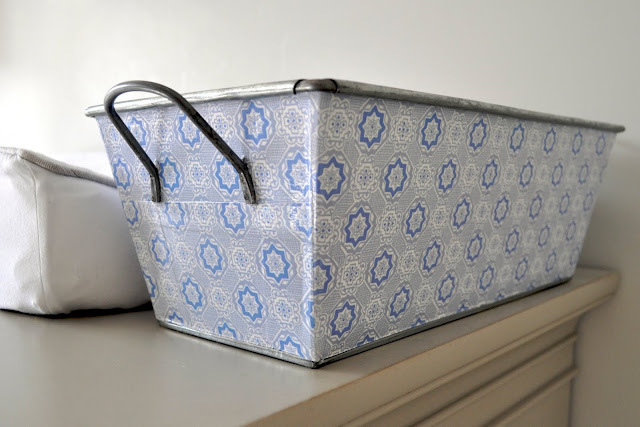 I've been looking into crafting an upholstered valance but haven't yet settled on the perfect fabric! Perusing my favorite stores, in person and online, for special finds to incorporate into the nursery design was a most treasured hobbies during my pregnancy. 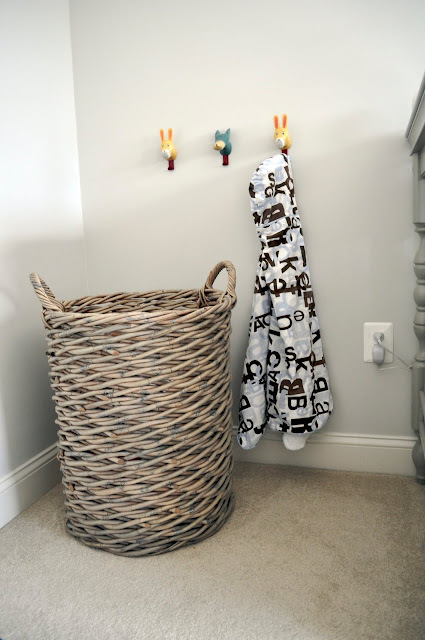 One of my favorite elements of Roscoe's nursery is the variety of textures that I was able to incorporate into such a small space: a soft jersey rug, plush seating pillows, basket weave, rattan and linen lamp shades, leather upholstery, and a grasscloth tree silhouette. It's visually interesting, and full of tactile stimulation for little hands and bodies to explore. I hope to always remember those last few weeks of my pregnancy when we often found ourselves just hanging out on the floor of the nursery, dreaming about our son and trying to imagine the ways in which our life was about to change. Roscoe's cool, eclectic, nature themed nursery is everything we had hoped it would be, and continues to bring us so much joy. Without a doubt it's my favorite room in the entire house. A special thanks to our photographer, Mel Worthington, from Worthington Photography for sharing with us her talent as well as a few of many lovely photos she took at Roscoe's two week photo shoot. If you want to see more incredible nurseries (and lots of adorable babies!) 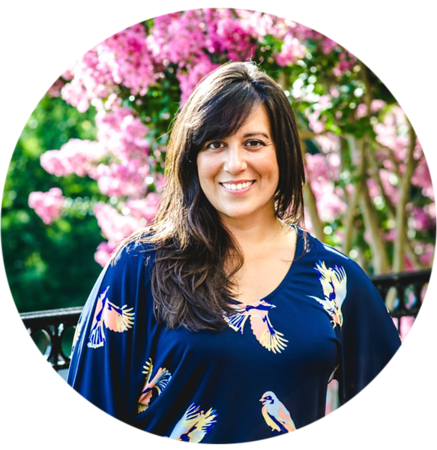 check out the "newborn" section of her blog. And stroll over to Spearmint Baby, it's chock full of nursery inspiration! 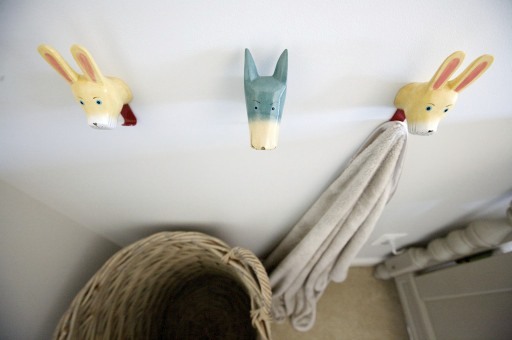 Wow - I LOVE his nursery!! Planning Chloe's nursery will also be one of my most favourite times! I love it...thank you for sharing it! I love your source of inspiration and the way you have used the same colors in the nursery. 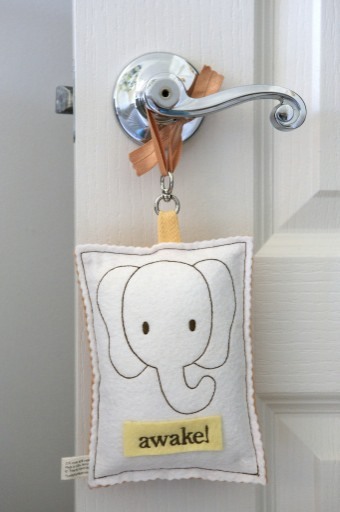 Soft, snuggly and sophisticated, is how I would describe your nursery. Can I share it with my readers? 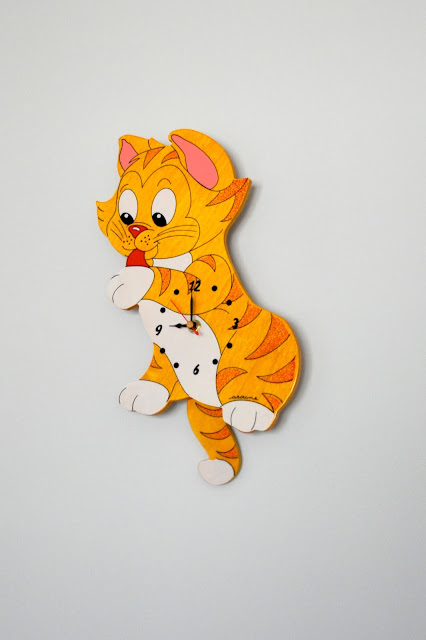 You can email me at richa (at) decoratingideas4kidsrooms (dot) com. @ Lovely Little Nest: Thank you! 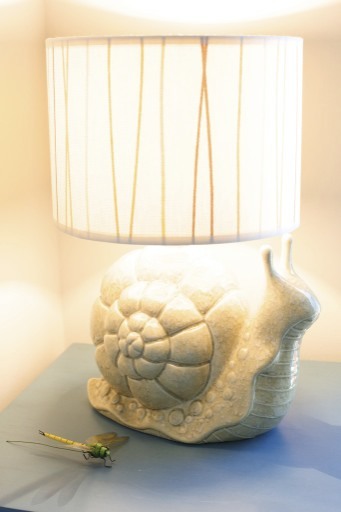 I found the snail lamp at Anthropologie, isn't it cool? Great job....You must be proud.